At this National Cemetery lies the remains of my third Great Grandfather Dennis Hurley. Dennis Hurley was born in Ireland circa 1823. At some point in time he moved to England and lived with his wife Mary Ann Lomax. (Mary was born in England) Their first two children John & Mary Ann were born in England. The family immigrated to the USA in 1849 probably to escape the potato famine and is found in 1850 in Salem, MA according to the census of that year. In the 1860 census the family is found living in Biddeford, ME. While in America Dennis & Mary had three more children Ellen (born in MA), William D (born in ME) & Elizabeth M (born in ME). On 8/20/1862, at the age of 40, Dennis enlisted in the Union Army as a private. (About 1.5 years after the war began) He was in company G of the ME 8th Infantry. He was listed as a POW after the battle of Drewry's Bluff, VA on 5/16/1864. 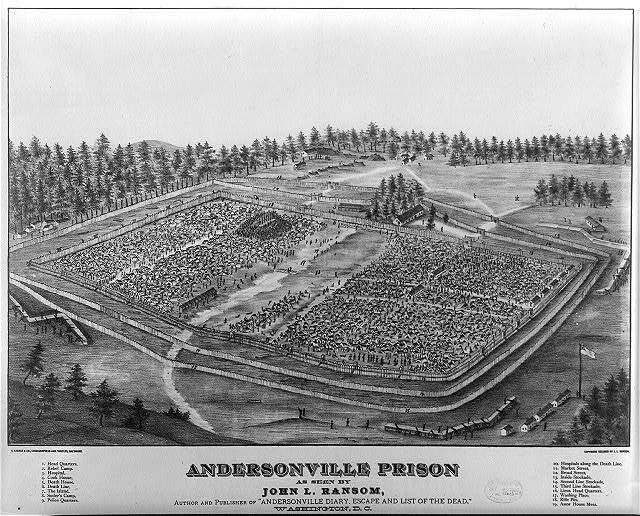 Dennis was sent to the infamous Andersonville, GA prison after being captured and died there on 8/4/1864 of dysentery. He is buried at the Andersonville National Cemetery, Andersonville, GA (Grave #4703) according to Civil War records and the current records of this US National Cemetery. In the records of St Mary's Cemetery in Biddeford, ME he is also on the register as being buried in the St. Brendan section, block 1 RH, Lot 5. More than likely this was a grave site that was purchased by the family prior to him leaving for war. It is unlikely that Dennis was interred from Andersonville and buried along side his wife Mary Ann Lomax-Hurley at St Mary's.